Last season I was asked to contribute to the programme by offering the Barnet 11 (plus five subs) I thought were the best I’d seen play. Obviously with my first game being in the 93/94 season, I missed out on previous ‘legends’; as well as being too young to remember or understand many players others will suggest. Lee managed to reach the feat of 300 appearances for the club in two spells. Player of the Year for three consecutive seasons and countless match-saving performances who else could it have been? – Although Maik Taylor comes a close second. His buccaneering runs up the wing still come to mind. Also a good man to take a penalty – except when he missed! Left in somewhat sad circumstances, where he now assists Gillingham manager, Andy Hessenthaler. Kingy was like two players in one. Focused, committed and commanding at the back – and a massive loss when he left. Now regarded as a god at League Two rivals Gillingham despite his terrible injuries. A Barnet legend and another player who eventually got the opportunity to ply his trade in the Premiership with Portsmouth. Committed, inspirational, an all-round outstanding centre-back. Yaks joined as a youth and always gave his all. Despite his somewhat dodgy distribution no-one could really believe it when he finally left the club. He gets my sentimental vote, though Greg Heald was probably a better player. His performances were the highlight of a dreadful season! The tricks he pulled off were mesmerising, causing him to be double marked in every game – and even then, defenders got caught out! Fantastically unpredictable and always played with a smile on his face. A wayward talent, Punch always gave the impression of being someone who could play at a much higher level – if only he could put his mind to it! He got that opportunity last season playing on loan for Blackpool – netting three times, for the relegated side. “If there’s anybody else out there, who scores goals and got ginger hair…” Another player clearly capable of making the step-up. Bags of energy and terrific strike to match – has proved his worth at Charlton and now Middlesbrough. Deano always looked like class on the ball. Weighed in with a fair few goals too and seemed to take the game in his stride. Moved on to better things at Charlton – although his short-lived return on loan in 2009/2010 was a bit of a damp squib. But he did score that famous goal at Old Trafford in 2005. What a night! Another club legend – as a player and now as assistant manager to Lawrie Sanchez. Graz’s goals propelled us out of the Conference in 2005 and he remains an inspiration for all strikers joining the club. What can I say? Once voted ‘’The Greatest Barnet Player of all Time’ after just one year at the club. Dougie currently manages Crystal Palace and last season continued to big us up on Late Kick Off – even at our lowest points! Those 27 goals in his debut season at Underhill speak for themselves. Maik – who later played in the Premier League with Southampton, Fulham and Birmingham - comes close to taking the goalie’s jersey from Harrison in my starting eleven, but Lee probably shades it for longevity. Has also had a highly successful career with the Northern Ireland national side. 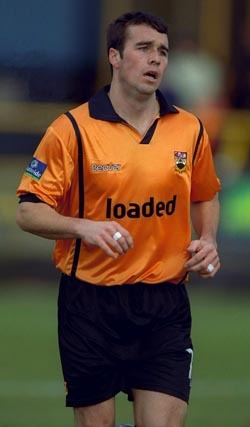 The ever reliable Greg Heald joined Barnet for a club record transfer fee of £130,000 in 1997 and stayed for five seasons, weighing in with 20 goals over the period. A good man to have at the back in a crisis. I remember Barnet-born Scotty as much for his spectacular somersault celebrations as his many goals, but I also remember his incredibly committed performances. Although currently a free agent he was still banging them in last season for Leyton Orient, aged 37. Also known as ‘The Tattooed Man’, Darren made up in tricks and deftly delivered dead-balls what he clearly lacked in pace. Famous for missing That Penalty v Torquay (though he did have a hand in our first goal on that fateful afternoon). 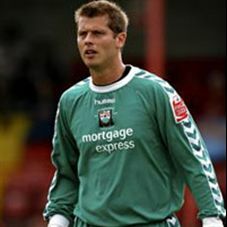 Fans favourite Sam Stockley racked up over 200 appearances over a five-year period from 1996 before moving on to Oxford United for the tidy sum of £150,000. Carling Cup: does anyone really care?